This homemade costume for babies entered our 2014 Halloween Costume Contest, and won 2nd place in the Cutest Baby Costume nomination! Emma Budd is wearing a home made costume of Maleficent. She was 6 days old when we brought her to her first movie. We made the costume out of a piece of cloth and lots of duct tape. The horns were wrapped with twine and electrical tape. The whole costume cost approx $25. I combined all the ideas from youtube and pinterest. Colleen-I made costumes for my dogs to be part of the characters from the movie. I got a simple template online for dog clothes and you can use that as a base for your outfit and just use the duct tape to make scales on the dress. On emma's outfit I used a triangle pattern for the scales. But be careful you don't want your dogs coming out looking like lizards. For the head piece I suggest a hood or cap to attach horns in so you can attach it to the dogs head easier. You just need to shop for horns to your dogs head scale. Then just wrap it with duct tape. Do you still have this, I will totally buy it off of you! Renina-its a piece of cloth that I cut out a circle in the middle for her neck. So it came out long enough to look like a dress. I then added duct tape and made patterns with it to look like scales. Then I made a small belt to hold it together. Do you still have this costume?? I would live to buy is... does it strech or adjust? At least the head piece? Do you still have this costume? 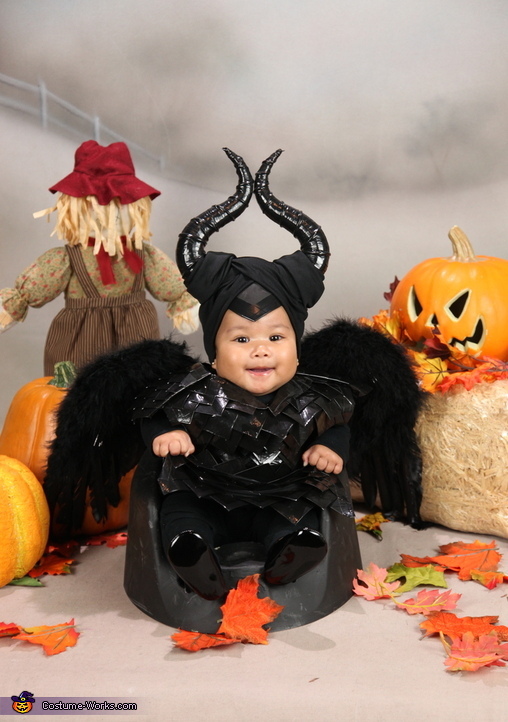 My daughters name is Harleigh Maleficent Brooke and she'll be 7 months old come Halloween and I would love to buy this costume off of you! How do you make the horn and stay on the head? Bobbi-I would sell it to you but it's in storage and I don't know if I still have all the pieces together. Amy-I used a headband and attached some devil horns to it. Then I used a piece of cloth and attached it to the headband as well and wrapped it up as a turban then I pinned them in place once I got it to where I needed it. I also used a dummy head to shape it because my baby at the time would not sit still. Hope this helps.